Sudan has signed a ceasefire with a major Darfur rebel group, the second deal in recent weeks, leaving just one band of rebels in open conflict. The Liberation and Justice Movement (LJM) - a newly formed umbrella group of 10 movements - signed the framework deal paving the way for further talks. Last month, a similar deal was closed with the Justice and Equality Movement (Jem), the biggest single rebel group. In the past the existence of many small factions has hampered peace talks. Optimists see the deal as a step forward to finding peace in Darfur, but agreements made in the past have so far had very little impact on the ground. With elections approaching in April, Khartoum has been boosting efforts to win over rebels ahead of the polls, while international pressure has been high to find a solution. The LMJ deal does bring several splinter factions into a ceasefire. However, as long as holdout groups refuse to negotiate and a comprehensive peace deal for all parties remains elusive, hopes for long-term progress remain low. However, as more groups negotiate with the government, pressure may build on those still fighting to open talks for future deals. But now, the only major group still holding out against the government is a faction of the Sudan Liberation Army led by Abdul Wahid, who has refused to take part in peace talks. "This is an important step which will give momentum to peace efforts in Darfur," said Sudanese Vice-President Ali Osman Taha, who was at the talks, according to AFP news agency. "We reiterate the commitment of the government of Sudan to press ahead with talks following this framework agreement." 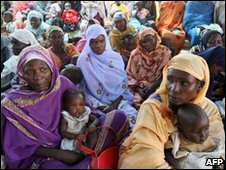 Since the conflict in Darfur began in 2003, some 2.7 million people have fled their homes and the UN says about 300,000 more have died. The rebel movements have been fighting government soldiers and Arab militias who many people say are backed by the government. Although preliminary peace deals have now been signed with almost all of the rebel movements, tensions between the groups still remain. Jem has been angered by the other rebels' refusal to join them at the negotiating table as one bloc and dismissed the LJM's deal, saying they had no military force on the ground. "The ceasefire is meaningless. It is a ceasefire without any fire," said Jem official Al-Tahir al-Feki, according to Reuters news agency. But he said his group would not walk out of the talks in Doha in a "reflex reaction". Earlier this week, a deadline was missed for a final agreement between Jem and the government, a month after they signed their preliminary deal.